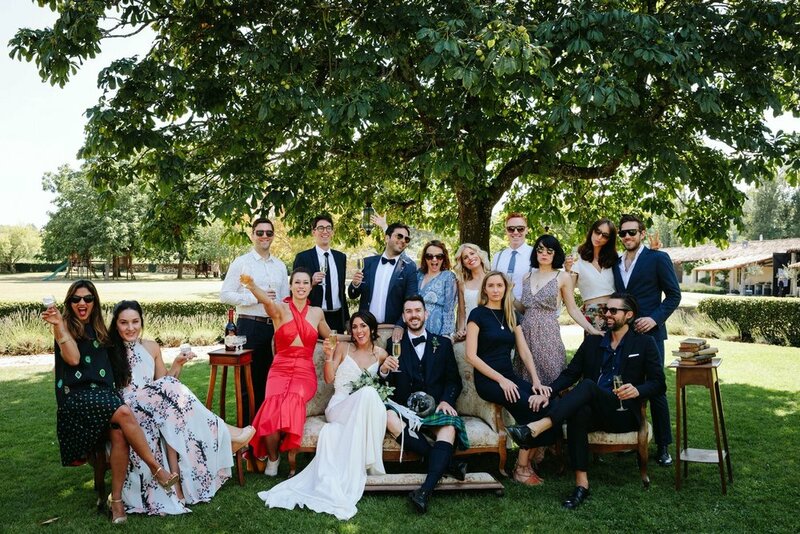 We love a wedding and like us you feel the need to wear a new outfit to every wedding you know that it can be not only costly but not exactly sustainable. A wardrobe full of one time wear dresses isn't the best for the environment, wallet or space. SO with sustainability being one of top beliefs here at v & l we decided to make our own outfit. Where to start you ask? 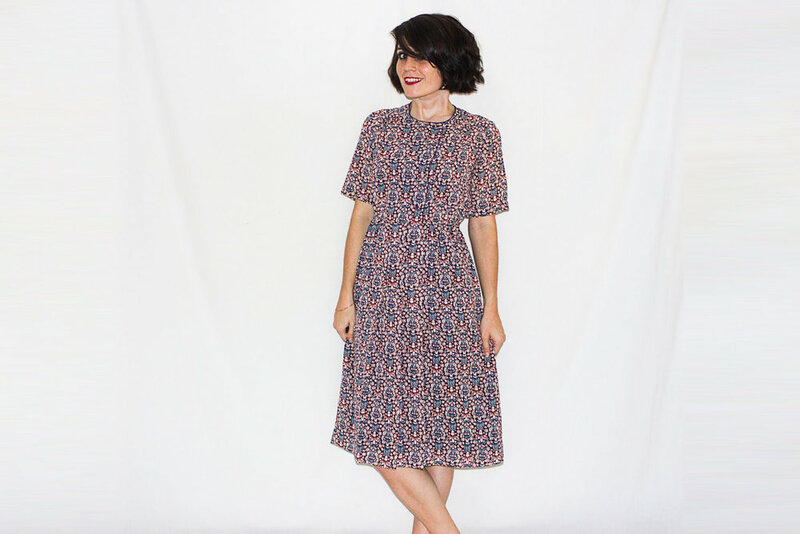 Well, we were sifting through the piles of vintage that were hiding in the studio when we came across this little printed gem of a dress (see below) and although it wasn't quite right for the summer wedding outfit we had envisioned the print was on point. So what a better start for the wedding outfit. Taking it apart wasn't as time consuming as first thought, which can always be a draw back for a project such as this. Next step we scoured the internet and Instagram for inspiration until we had an idea of what we wanted. Initially we were looking to make a dress but why make a dress when you can make a jumpsuit! Bold move on our part but we were determined. Looking at the pieces from the dress we knew that it would be a stretch but also very little waste to make this a jumpsuit. Using the sleeves as the front pieces allowed the skirt and body to be used for the pants. Drafting the patterns was made easier using previously bought pants as a template (always a good idea). It became clear that for the wide pants that we were looking for would have to be made from several pieces. (This thankfully turned out OK as the fabric is printed and not noticable, but if using a solid or less densely patterned fabric we would advise against this.). Making the pants was surprisingly easier than expected, the top part however was slightly more tricky to get right in terms of fit. Everyone is different, so we made this to fit our body - tailor made shall we say. Not going to lie, it took a few tries to get the gaping down to a minimum - no one wants a flasher at their wedding! We used the lining of the original skirt to line the top and to make the bias-cut straps. We even used a section of the original fastening to close the back above the zip. We used pretty much all of the original fabric with the majority of left overs being the lining. We are really pleased with how it turned out, it was great to wear to wedding and will be useful for summer nights out for sure. Below is a breakdown of the steps of how to get achieve a complete re-design from something you already own. Happy DIY-ing peeps. Find a garment you love the fabric of, and carefully take it apart at the seams and press pieces flat, it might not be necessary to unpick the fastening at this stage - see point 5. Using inspiration create a pattern based on the idea or use garments as a guide. 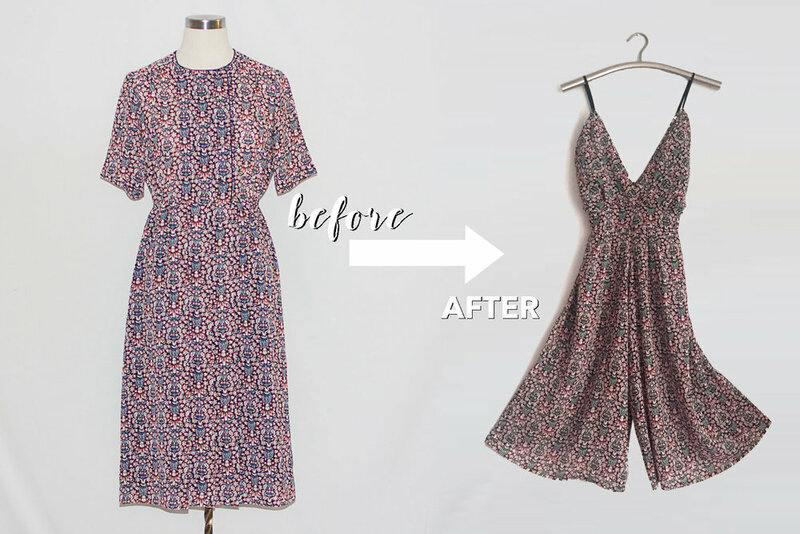 Sort pieces to find which will work best for the new pattern, for example the sleeves were great for the front of our jumpsuit allowing the skirt and bodice to be used for the wide leg pants and waistband. If needed sew pieces together to allow for pattern (like we did for the pants). Try and use as much of the previous fastenings as possible - we cut a piece of the front to form the back waistband and used a button and buttonhole already existing as a closure. Always try on your piece at various stages to ensure the fit is just right for the intended purpose. When still our jumpsuit was great but with movement (dancing) it was clear the front gaped too much so some delicate hand stitching was needed to keep things modest. If possible try to use all the fabric from your original, thus creating a zero waste DIY! Our leftover lining will be used in binding for other projects.